Happy Hanukkah Thursday to all of you! Did you know that this year, Hanukkah goes from Tuesday evening, December 12th to Wednesday evening, December 20th. 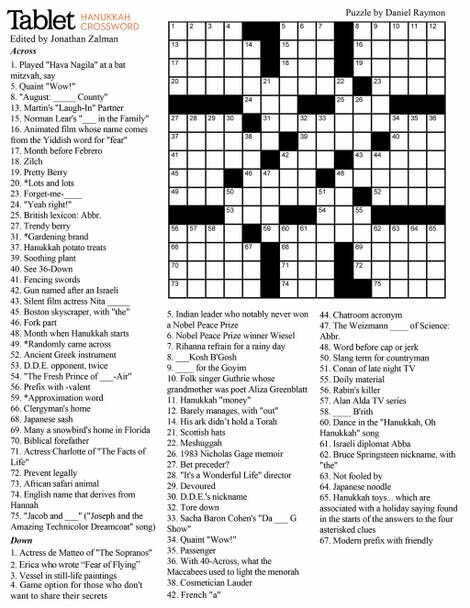 So this week, I give you a crossword in keeping with the Hanukkah holiday. :) So welcome to our Cross Thread which we share across our friend’s and neighbor’s sites; Whitenoise, Hackerspace, Groupthink, Powder Room, Odeck, Tay, Oppo, Backtalk, Clashtalk, CrossTalk, Gawrker, and The Salad Bowl which always makes for a good time. This week, we had some posts from Tony on Pocket Friendly Phones, How VPN’s Help Protect Your Data, and The Rise of Sports Live Streaming which I’ve gotten very familiar with since the WeatherTech series barely gets any air time at all! The BlitzWolf Selfie Stick got some page time as well! So tell us what your month has been so far. Busy? Slow? Mine’s been busy and today, holy wind! We’ve had 50mph wind gusts all day, we’ve had a couple inches of snow and we’re supposed to get up to 6 more tomorrow. (Revised to say, we got a total of 11 inches yesterday and overnight!) Are you warm and snug? Or in the frozen wastelands refusing to set foot outside? Let us know in the comments section how this month of holidays is going for you. But please, no politics. There are plenty of places on the Kinjaverse for that.